Kukveni-footprints-are a powerful historical metaphor that the Hopi people use to comprehend their tangible heritage. Hopis say that the deity Maasaw instructed their ancestors to leave footprints during their migrations from their origin place to their home today as evidence that they had fulfilled a spiritual pact to serve as stewards of his land. Today's Hopis understand these footprints to be the archaeological remains of former settlements-pottery sherds, stone tools, petroglyphs, and other physical evidence of past use and occupation of the land. 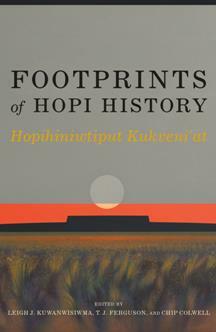 The fourteen chapters in Footprints of Hopi History: Hopihiniwtiput Kukveni'at focus on these Hopi footprints as they are understood through a variety of research techniques, including archaeology, ethnography, documentary history, plant genetics, and educational outreach. The editors and contributors offer fresh and innovative perspectives on Hopi archaeology and history, and demonstrate how one tribe has significantly advanced knowledge about its past through collaboration with archaeologists and cultural anthropologists. The book features managerial uses of research, cultural landscape theory, use of GIS in research, archaeological interpretations of social identity and immigration, analysis of corn genetics, heritage education of youth, and research of oral traditions and documentary history. Footprints of Hopi History highlights the Hopi tribe's leadership in sustained efforts to create bridges between tribal goals and anthropology, forging a path for others to follow.